Geri’s Game was Pixar’s return to short films after an eight year gap without making one, with that came a new writer and director in Jan Pinkava that made a change due to John Lasseter’s dominance previously. The story itself is different and in a whole Geri’s Game is refreshing and unique. You can certainly see that in those eight years a lot had changed, with the quality of the animation taking a huge leap forward furthermore our main character is actually human. We follow Geri an old lonely man with a passion for chess, we see him in a tough game against his biggest opponent himself. It’s completely different and in a way bizarre but it works and is absolutely hilarious. Jan Pinkava deserves a lot of credit for an inventive idea that is superbly executed from sound, story and animation. Geri sitting in a completely empty park begins the game and switches seats physically moving from black then white, as the game looks to heading to only one conclusion Geri makes an aggressive move that changes the whole game. It’s crazy to think that there’s a film focusing on an old man playing himself at chess but its even more crazy to think that it’s so entertaining and funny. The short film lasting just under five minutes was released with Pixar’s very popular feature film A Bug’s Life and deservedly won an Oscar. It was definitely with the eight year weight as its simply brilliant, one of my favourites. Watch Geri’s Game here and tell me what you think? Knick Knack is another Pixar animated short, again the ever so talented John Lasseter playing creator. In my opinion this is the most hilarious and funny story yet providing many laughs, its also accompanied by a fun feeling score only adding to the entertainment. This time Pixar bring a bunch of holiday souvenirs to life as the story follows a snowman trapped in a snow-globe who attempts to escape in order to attend a hot party with the other souvenirs however the dome around him causes more than a few problems. As the other souvenirs watch on the snowman attempts to smash the dome, drill through the globe and even blow it up but that only leads to more trouble as the globe frantically leans over the edge of the shelf. The attempts provide us with many laughs and the persistency of the snowman only makes it more entertaining. 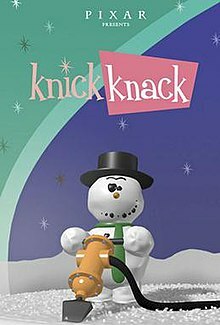 Knick Knack is certainly funny with a good inventive story by John Lasseter but for me the adding of the fun score is why this animated short stands out from those previously made. More so the addition of more “characters” and those extra details just show how amazing Pixar have progressed. The short film of just over three and a half minutes was released with the feature of Finding Nemo (2003) but surprisingly didn’t win an academy-award nor get a mentionable nomination. Out of those watched so far I think that Knick Knack is my favourite just for its fun feel, it also has more of that modern Pixar touch. Simply brilliant and unique. Let me know your views on Knick Knack, watch it here. I remember watching this film as a kid in the cinema and just like most others my age I found it amazing and exciting, seven years later although not as excited and amazed I still very much enjoy it. Night At The Museum has had some really bad and in my opinion unfair reviews, it has a predictable somewhat plain storyline but then again not many films break that mould, what this film does do though is create laughter and give you a new look at history. It has a great cast from Ben Stiller to Owen Wilson and Ricky Gervais and the special effects are what you expect but still of quality. In general this film is very watchable and if you let yourself you will enjoy it and be entertained. Ben Stiller plays the character of Larry Daley, divorced and unemployed he’s a complete loser but the failed marriage and career doesn’t bother Larry as all he wants to do is be a good father and impress his son, Nick. When finding out he might be getting evicted Nick and Larry are disappointed to say the least but in a desperate need of a job he takes up the vacancy of a night guard at the natural history museum. There’s a saying that at night history comes to life, unfortunately for Larry it just happens to be true. When the sun sets all the museums exhibits come to life, from Rex the dinosaur to cavemen and elephants. After somewhat settling in on the job Larry invites his son to spend a night shift alongside him however the retired guards Larry replaced set out to steal the museums most precious treasures, with the help of the most historic figures Larry must stop the guards and save the museum all before the sun rises. The supporting cast to Ben Stiller as previously mentioned is outstanding and involves some big names. Owen Wilson and Steve Coogan play to rival figures one being a roman the other a cowboy, the two provide great laughter and some funny scenes. Others such as Robin Williams who takes on the role of Teddy Roosevelt and Ricky Gervais who plays the boss of the museum. The scenes as a kid excited me, seeing a giant dinosaur come to life and play fetch like a dog was amazing not so much now but it still brings a smile and that’s due to the good special effects. Due to the special effects not only does it bring amazement but laughter as some historic characters wreak havoc. Night At The Museum is very watchable like I’ve said and although really for kids if you let it, you will enjoy this film. The cast is great and this for me is the key to this film, all providing laughs and comical sequences they keeps you entertained. As a kid the dream is there, that you can walk into a museum and it comes to life, as an adult it’s about the special effects and more so the laughter. This was never going to be an iconic film or one that people will watch over and over but it entertains and that’s what its meant to do. Fun, creative and hilarious. Pixar and more so John Lasseter by 1988 had started to get the hang of making animated short films and in their latest edition Tin Toy it well and truly showed. Just falling short of five minutes long it shows how a one man band tin toy has to choose between survival and doing its job. Fun, Inventive and simply brilliant Tin Toy shows the life from a toys perspective bringing objects to life once again. A one-man wind-up toy finds trouble with a big destructive baby, doing everything to flee and survive he hides under the sofa however when the baby falls to the floor and begins to cry he chooses to do what a toy does and risk his safety. Its hilarious and at the same time adorable due to the behaviour of both our characters and the expressions shown by the fantastic animation. The animation for a 1988 production is unbelievable and the progress from their first “The Adventures of Andre and Wally B” is remarkable and this was deservedly noticed as it won an Oscar. The expressions and from the characters is amazing and so is the detail surrounding them, something that’s improved. The sound also plays an important role in the film. 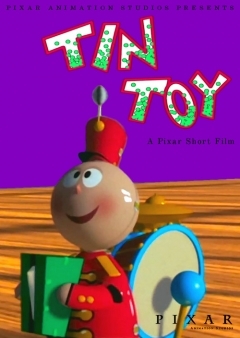 Tin Toy was released with Toy Story in 1995 one of Pixar’s biggest features and names. It will make you laugh and chuckle, and the whole thing together has that special feeling, simply brilliant. Let me know what you think and watch it here. In 1987 came Pixar’s third short film and with that they decided to be more adventuress than those previously made. Red’s Dream is funny and adorable with “Family” written all over it, once again bringing life to most common objects this time Pixar choosing a bike. Sitting in a shop we see Red the unicycle hidden away in the for sale corner, sleeping away we enter his dreams of a better place and life. This is where the humour begins as we see Red’s dream about becoming a circus act juggling away and stealing the show from a clown. The animation of this short is again amazing for 1987 with improvements on those previously made. John Lasseter also behind Luxo Jr. is the man behind Red’s Dream writing and directing once again. This time the short is four minutes long, twice as long as previous films made giving Lasseter the chance to produce more magical stuff. 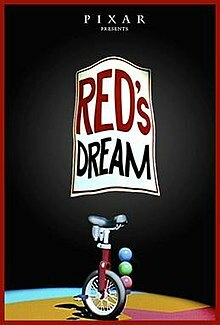 Red’s Dream is a simple story but once again it has that brilliant execution and although simple it makes a lot of laughs and even some sympathetic “awww’s” from the audience as poor old Red sits there in the for sale corner. Although not released as part of a feature this short film has made cameos in many Pixar films over the years. Fun, inventive and again simply brilliant showing the progress Pixar have made and foreshadowing those great things to come.